More than 3 million children in South Africa experience chronic hunger every day. Whilst nutrition remains a national priority, there are still millions of children who start their school day without a nutritional breakfast and a guarantee of a wholesome meal for the day. Christel House South Africa, a non-profit school in Cape Town, enrolls 750 children from twenty disadvantaged communities in the Cape Flats. As part of its holistic education model, they provide each child with two nutritious meals and a snack daily. 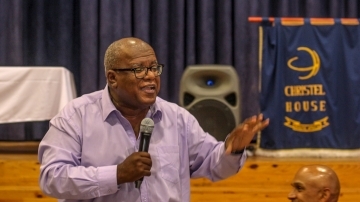 The school has launched its ‘Feed a Future’ campaign to raise critical funding needed for its school feeding programme in 2019. Today more than 66 million primary school-age children attend classes hungry across the developing world, with 23 million in Africa alone. Chronic hunger and malnutrition can cause not only various long-term developmental effects like stunting, but it also has a debilitating effect on a child’s ability to concentrate in class, retain information and ultimately their future. Alarmingly, more than 34% of children in South Africa in grades R-12 die from malnutrition and 27% of these suffer from stunting. Achieving Zero Hunger by 2030 is one of the 17 Sustainable Development Goals set out by the United Nations. Established in 2001, Christel House South Africa’s mission is to break the cycle of poverty and build self-sufficient, contributing members of society. Only children who come from homes where the average monthly income per household member is R1,500 or less is enrolled into the school and receive a holistic, no-fee education up until grade 12. Given the severely impoverished homes that its students come from, the meals received at Christel House are usually the only food the child will receive that day. Christel House’s ambassador for the Feed a Future campaign is 10-year old, Mvano Hlalentla, who shares her journey in the 30-second campaign video. In the video, Mvano describes her journey of understanding where she comes from yet knowing what she aspires to become, and how with the help of Christel House and the public, she intends on reaching her dreams. Mvano is one of 750 students currently enrolled at Christel House from grade R to 12, and who have been given an opportunity to excel. 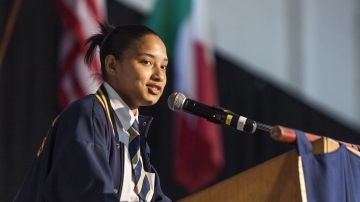 The grade 6 pupil has taken on her role as official ambassador for the campaign with excitement and is passionate about helping the school achieve its goal of raising a R 1 000 000 to help feed her fellow students. The cost to feed one child is R20 a day, R420 a month and R4350 per year. Since launching the campaign at the end of 2018, Christel House has been privileged to receive support from businesses such as KFC Add Hope, FoodForward SA, the Peninsula School Feeding Association, the Galileo Open Air Cinema and the Stellenbosch Golf Club.